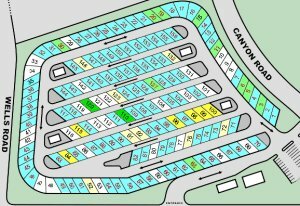 Map support in Campground Master is the most advanced and flexible available. You'll see many examples below. You can do the map setup yourself, either now or anytime later when you're ready. Update it yourself any time you like -- you don't have to contact us every time you need to make a change. You can use any image you like for the map background, and put the interactive status indicators for each site on it as needed. For a quick and easy map created on top of something like a scanned brochure image, you can use circle or rectangle indicators of any size for your site status (see below for details on what these indicators do). If you want a cleaner, more professional look, then you can create a map suitable for "fill" indicators, so that the coloring of each site is the actual shape of the site. You'll see the difference in the examples below. If you don't have a suitable image available, we can also create a map for you. Another advanced feature is "hot-spots" for navigating between multiple maps. This can be used on an overview map, for instance, where clicking in a section changes to the zoomed-in view of that section. It can also be used to create "buttons" on a map to change views, for instance to move "Up", "Left", or "Go To Marina". Here are a couple samples of the Map view, which are in the sample database included with the downloadable free demo. 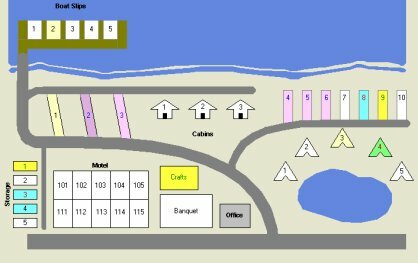 This first map uses a variety of rectangle and circle site indicators. They can be placed anywhere on your map and made an appropriate size. If site numbers don't exist on your map (or the indicator covers the number), the site name or number can be included in the indicator. 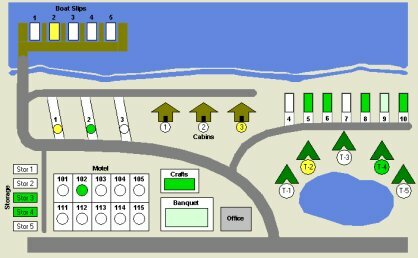 The map above is the same basic map, but uses some different options. Instead of simple rectangles and circles, the Fill-type indicator has been used to completely fill each site's outline. This results in a cleaner map, especially when odd shapes are present. Also note that the colors are different -- this shows the option to use the reservation status colors instead of the simple Occupied/Available/Reserved colors. So instead of just seeing green for Occupied, you see the same indication as you would on the rack. Now you can see which sites are group reservations, which are monthlies, who has not paid in full, which are guaranteed reservations, and so forth. Remember, the map background can be anything you like, and you have complete control over the position and size of the site status indicators, so the possibilities are endless. Here's a map that we've done for one of our customers. Note that the spaces can be any shape, and have been designed so that the "Fill" indicators can be used to fill the spaces with the status color. Here's another map that we've done. Notice that the site numbers can be shown at any angle to fit the site well. 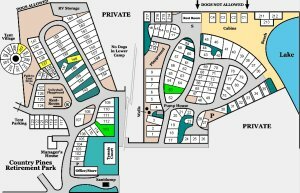 Our customers are a creative bunch -- while most of them use a scanned brochure or a map from their web site, some can get creative in the way they use it. Click on any map for a full-size view. Customers, if you have created a map and would like us to showcase it, let us know! "I am so excited I just had to email you right away. 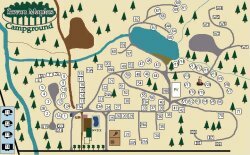 I got the new map to work: I created a site map of the park using "Paint" from Windows. Since I'm an amateur artist anyway, I found it fun. I love being able to print it out at the end of the day to show next day's availability of sites --- we were doing this by hand everyday!!"